What Pitch of Chain Do I Have ? Simply use a ruler ot tape measure to find the distance in mm across three consecutive rivets - this will tell you the chain pitch. To find out how many links, just count the links. 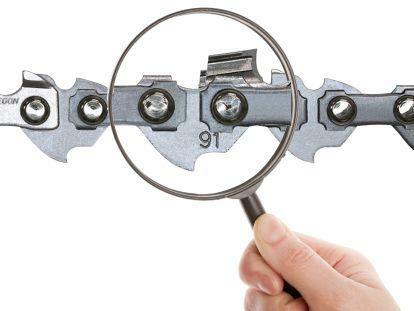 3/8" - this type of chain saw has a distance between three consecutive rivets of about 19.2 mm and is available with a thickness of 1.1mm, 1.3mm, 1.5mm. 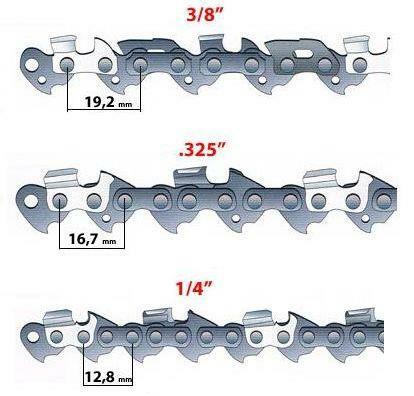 .325" - this type of chain saw has a distance between three consecutive rivets of about 16.7 mm and is available with a thickness of 1.3mm, 1.5mm, 1.6mm. 1/4" - this type of chain saw has a distance between three consecutive rivets of about 12.8 mm and is only available with a thickness of 1.3 mm. We have found that the easiest way to find both the pitch and thickness of a chain is to just look at the code stamped onto one of the links. Every chain should have an identifying code - look at the example pic. Then it's just a case of counting the "links" - a link being the downward protruding bit, as shown with the "91" on our picture.